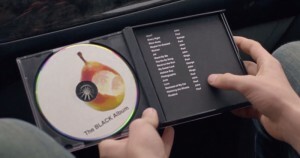 For me one of the best moments in Richard Linklater’s Boyhood is when Ethan Hawke’s onscreen son Mason is gifted with a “perfect post-Beatles Beatles album” dubbed The Black Album. Which is not to be confused with the DJ Dangermouse Beatles/Jay-Z mashup album entitled The Grey Album but both are plays on the Beatles most excellent The White Album. Get it? Good. According to Hawke’s character “Dad” who created this opus the album is a three CD collection of solo works by the Beatles after they broke up. 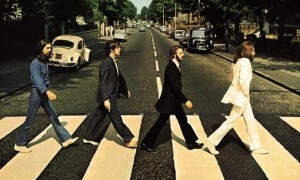 The purpose of the album is to show how if you take certain solo works by the Beatles and place them side by side with other solo work from former Beatles you can see just how much The Beatles elevated one another musically as well as helped compliment and refine one another in the mere ten years they were together. Yet as I’ve been listening to The Black Album pretty much non-stop since receiving a copy about two weeks ago, I find myself not entirely agreeing with Hawke’s assessment of this collection which is one he actually made in real life and gave to his own daughter under the same auspices that occur in the film. In fact as a father and a huge Beatles fan myself, the liner notes he wrote for the album are pretty much one of the most beautiful things I’ve read of late. And it’s a fantastic collection as well. Yet whereas Hawke brilliantly breaks down what each Beatle brought to the table and how each other Beatle kind of tempered these creative and personal tastes to make a cohesive whole, he says this album shows that. And while I see what he’s getting at, for me I think The Black Album not only shows why the Beatles probably broke up but is also a brilliant example of a band whose whole is far superior than the separate parts that made it up. Again, this isn’t a negative review of this collection. I’m frankly touched and kind of blown away by the effort Hawke put forth in creating it and not just because he clearly did the heavy lifting…which required really knowing Wings and Ringo Starr solo stuff. But also because it’s a really intriguing look and listen at solo work by the Beatles after they broke up and not at all in a “greatest hits” kind of way, although most of the well known solo singles are included. While at first I tried to really key into Hawke’s assertion that if you listen to this all just right, you can hear the Beatles after a while I came to the conclusion that while that happens occasionally, what The Black Album really does is get back to the points he makes about each Beatle individually and how without the other Beatles there to slow them down, they kind of navel gaze in ways that can be entertaining but moreover on-the-nose and frequently kind of tedious. The breakdown of the three CD’s in the collection serve as a kind of trilogy for the Fab Four going it alone. The first album consists of many of the hits or better known songs from the boys including “Band on the Run” and “Jet” by McCartney and Wings, “Woman,” “Watching the Wheels” and “Stand by Me” from Lennon as well as “My Sweet Lord” from Harrison. “Photograph” from Starr is also present and kind of becomes the thesis statement for the first act of this compilation, especially in terms of how fans feel about the break-up. Still, solid representations all around. But disc two is where we really see the divides that broke the group apart. For instance John Lennon was an extremely angry guy who frequently used his music to search for the source of his pain and maybe correct it by getting it out there. But Paul was pretty happy-go-lucky most of the time and was mostly dedicated to catchy pop and “silly love songs” (What’s wrong with that, I’d like to know?). When working together the two evened each other out but prime examples abound in disc two of the Lennon and McCartney operating without the steadying hand of the other. Disc two kicks off with Lennon’s honest but ragey “God” and is then followed up with Wings’ charming but trite “Listen to What the Man Said.” As if these two songs back to back don’t offer up proof of the inextricable differences between the two geniuses, Hawke next places Lennon’s musically contrapuntal “Crippled Inside” on the track listing in which a skiffle-style band plays cheerily over lyrics of Lennon explaining that when you’re completely broken and fucked up inside, every little thing you do in life is basically a lie. Then, as if to further drive home the point of the disparity between the four individuals, Hawke places Ringo’s dippy cover of “You’re 16, You’re Beautiful (And You’re Mine)” next which actually feels musically seamless following Lennon’s jug band therapy session but really shows what each man wants to share musically from the depths of their hearts. This sort of musical sparring happens a few more times on disc two (Lennon’s devastating yet hopeful “Mother” wedged between the cheery “Let ‘Em In” and lamely named “Helen Wheels” by Wings) but by disc three, it feels as though Hawke and we listeners are brought back to what banded the Fab Four together” love and the search for it. The final disc shows Lennon mellowing and includes the sweet “Grow Old With Me,” “Oh My Love” and the peerless “Imagine.” Harrison chimes in with “Give Me Love (Give Me Peace on Earth)” and “All Things Must Pass” and McCartney is represented with Wings’ “Silly Love Songs” and “My Love.” Hawke also sneaks in the Beatles song “Real Love” which was remastered in 1995 and is a recording Lennon did that the still living Beatles recorded overdubs onto. It’s not a great song and sounds like a Beatles cover but it fits the theme of disc three to a tee. The Beatles all needed and loved one another, at least for the time they were together. Every Beatles fan knows this and Hawke makes this idea the basis for The Black Album and says so in his liner notes. And again, this is a brilliant collection that reminds me of a heartfelt mix-tape I’d make for a girl I was crushing on back in the 1990’s. But whereas Hawke seeks to reunite The Beatles with this album (a fine idea indeed) I can’t help but see four individuals who found one another and created the greatest music ever but ultimately their differences blew them apart. Paul wanted to soothe with his music, John wanted to work for change both personal and societal. George found peace and love with Hinduism and Eastern religion and Ringo was just happy to be at the party. 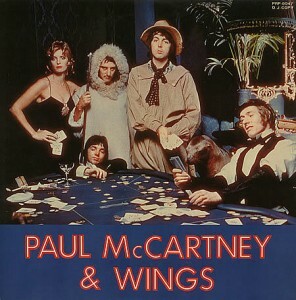 If you can track down a copy of the album, I suggest you do so as it’s a wonderful collection of post-Beatles music. However The Beatles were a beautiful and rare comet that shot across the sky before imploding and nothing can bring them back, especially now. But we’re all so lucky to have the music they created and Hawke’s attempt to get the band back together is genius, but it’s something that can never be. Sorry for the delay….there’s a BLACK ALBUM playlist on Spotify!! Enjoy!